Using the Metacoda Identity Sync Plug-in with a new SAS installation is easy. All of the defaults are based on common practices for synchronizing Active Directory users and groups with a SAS metadata server. Using the plug-in with an existing installation, where users and groups have already been synchronized using custom code, takes a little more planning. One of the ‘key’ things to do is to configure the plug-in to use the same external identity key id attribute that was used in the custom code. If you have the custom code, you can find the prior key choice in that code. This post is about helping you find and recognize those external identity keys without necessarily having to study the code. An external identity key is a unique identifier for a user or group in an external identity source (e.g. Active Directory). It connects users within SAS metadata to the equivalent external user, so changes to the external user (including name changes) can be applied to the SAS user at some later date/time. In choosing a key from the external source, it is best to choose one that will stay constant over time, even after user name changes, directory reorganisation etc. There are a few different key choices available, and some are more likely to remain constant over time than others. 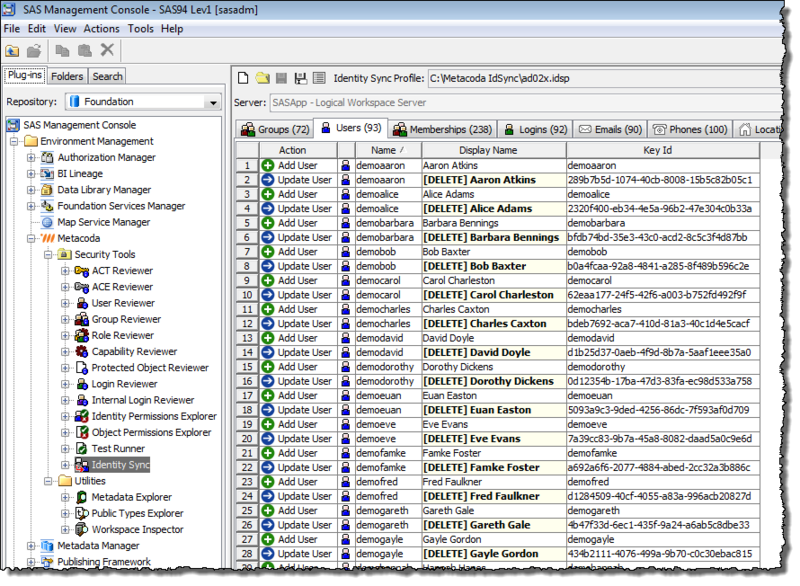 Later in this post I will show examples of some common external identity key id attributes. The key that is chosen for groups doesn’t have to be the same as the one chosen for users either. I often see sAMAccountName being used for users and distinguishedName being used for groups. At Metacoda we recommend using objectGUID for both users and groups (as explained below). Once a Key Id Attribute has been chosen it is important to continue to use the same one over time. Switching the key choice after it has already been used for a synchronization is not an easy thing to do, so it is good to carefully consider the initial choice before deciding to synchronize users and groups. Of course, sometimes you inherit the process and have no choice in the matter. When switching from one synchronization process to another, such as custom code to the Metacoda Identity Sync plug-in, it is important to continue to use the same key choice as before. If the key choices are different you might see something like this in the Identity Sync Plug-in, where every user or group looks like it will be (tag) deleted and re-added, and there are associated validation errors that prevent the sync from proceeding.